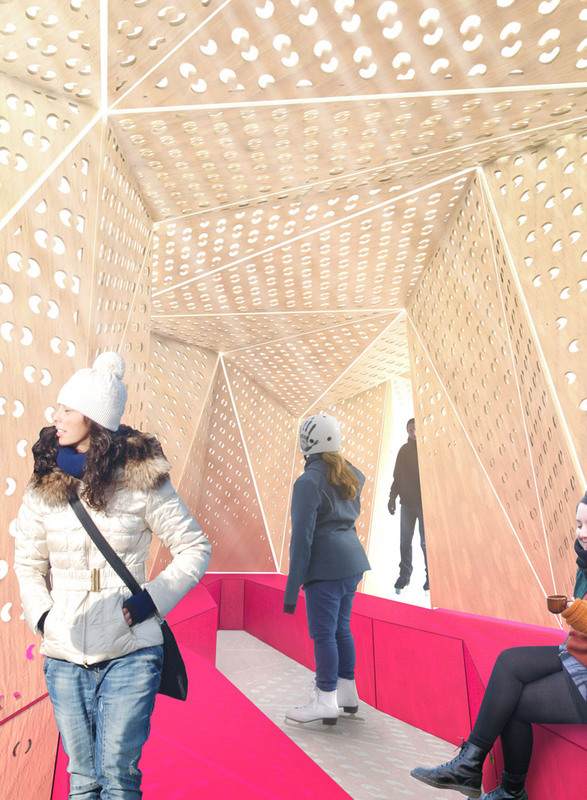 Le projet FOOTPRINTS a été développé dans le cadre du concours de design Warming Huts. Cette compétition, organisée sur une base annuelle, invite les participants à imaginer et développer des abris éphémères pour les nombreux patineurs qui sillonnent, chaque hiver, la Red River dans la région de Winnipeg. [TEXTE DE PRÉSENTATION, VERSION ORIGINALE] In 6000 B.C., native civilizations inhabited “The Forks” region, a strategic location for buffalo hunting. Since then, following populations dwelled the sector, where, among others, commercial activities played a major role. The installation proposed here is perceived as a trace, a footprint of the passage of buffalo troops, inhibitor of a succession of events that leaded to what is still nowadays a popular meeting place. 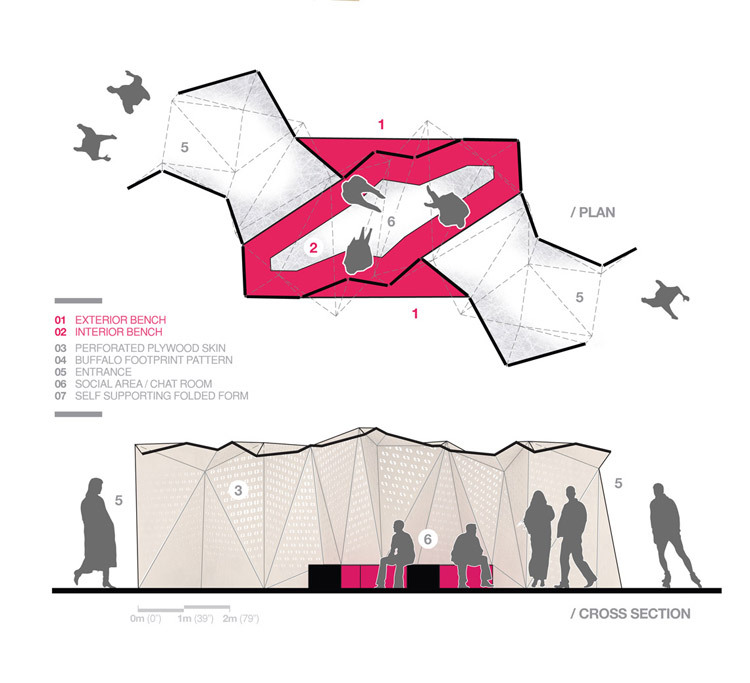 A geometrical simplification of a buffalo footprint has been populated across the skin of the hut, defining a perforated pattern. 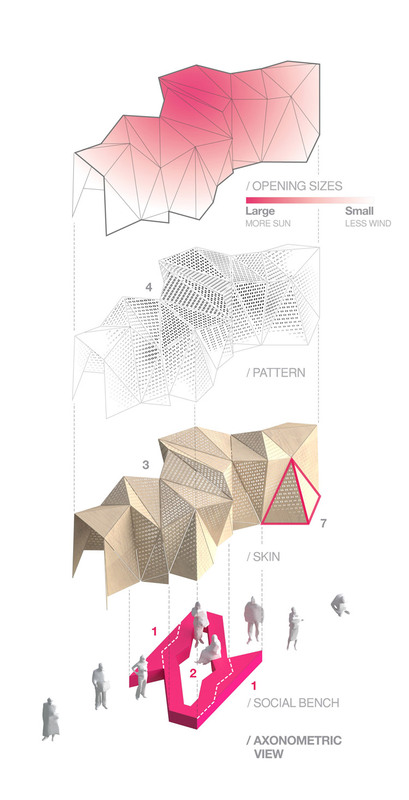 The variation of size and density of the holes modulates the ambiance across the interior space of “Footprints”, providing more or less sunshine and wind. The amount of light provided by the perforations is concentrated towards a central chat room. The latter is composed of a bench, ring-shaped to incite conversation. The seating volume expends across the skin, creating additional furniture on the outside. 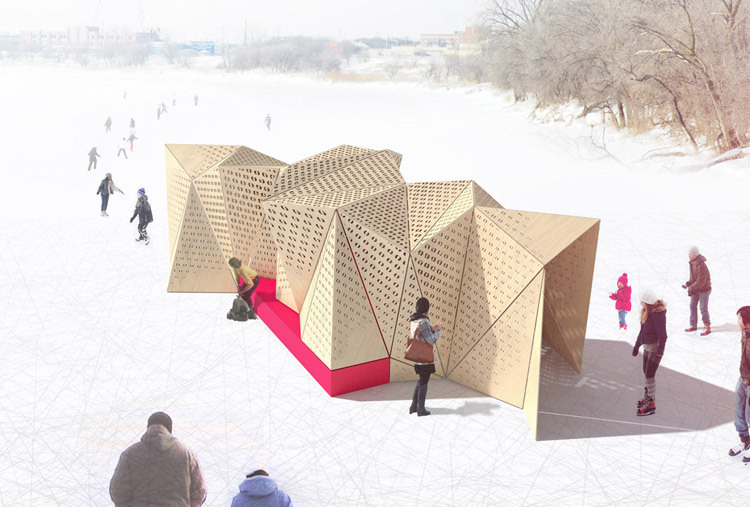 Materiality / The perforated panels would be numerically cut and their dimensions constrained to fit inside a 4’x8’ sheet. The prefabricated pieces would be transported on the skid and assembled on-site, as the bench would be separated in two pieces to meet the delivery requirements.